It appears most of Europe’s leading politicians are merely quoting one another when asked to comment on the Gaza massacres: killing (thus far) over 420 people and wounding more than 2,000 is a “disproportionate” act. And they all agree Hamas bear responsibility for it. Apparently, Israel has a license to freely kill every single member of Hamas it wants. Sure, Hamas are responsible for civilian casualties. But first of all, the number of Israelis murdered by Hamas doesn’t even come close to the number of Palestinians murdered by Israel. Second, if we apply the same standards to both sides, then Palestinians should get a free pass to target any member Israeli political parties such as Kadima, Likud or the Labour, since every Israeli government has been bathing in Palestinian blood. Israel is a highly militarised society where many, not least the West Bank settlers, carry weapons. Yet, when an armed Israelis are shot they are never reported as dead “militants.” Needless to say, they would be allowed to bomb any building belonging to the Israeli government. But the truth is that Israel’s “disengagement” from Gaza in 2005 was nothing more than the evacuation of Jewish settlers. Three and a half years on, Israel still controls the Strip’s borders, air-space and water. Under such circumstances, self-governance means little. In plain English: Gaza is an open-air prison. 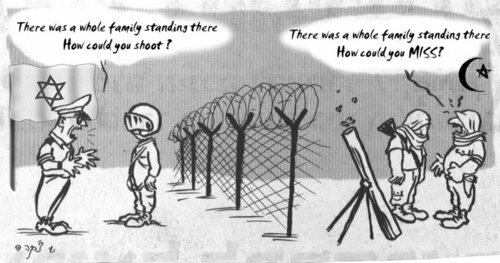 Because it has no roof, the Zionists are able to bomb the prisoners whenever they feel like it. Hamas leader Khaled Meshaal made clear that his group does want a cease-fire, but that it must be part of a wider agreement resulting in Israel lifting the siege on Gaza and open the crossings.2 Meshaal is perfectly right. While a cease-fire would end the immediate warfare, it would not make much difference in the long run as Gaza is on the brink of starvation. Yesterday, after I finished my lecture at one of Gaza’s universities, my wife asked me to bring some bread from Gaza City. All bakeries in our area have stopped operating because of the lack of flour and cooking gas due to Israel’s 18-month siege of the territory. I drove throughout Gaza City to try to find some bread for my four children, instead finding a miserable scene. On the drive back to my home in the Maghazi refugee camp in the central Gaza Strip, I saw dozens of people lining up in rows to get bread from al-Yazji Bakery. I quickly realized that it would take one or two hours until it would be my turn in line, by which time I might not find bread at all. So I continued my drive back to Maghazi, without bread. The devastating terror against Gaza and its population, I dare say, is relatively small compared to the long-term damage caused by the siege. The vast unemployment and the problem with malnourishment are signs of an approaching mass starvation. The number of Gazans killed indirectly by Israel is much, much higher than the 420 murdered in the last seven days. By destroying governmental buildings, the infra-structure and every seed to self-governance, Israel is hastening the awaiting disaster. Best of all – they can pin the blame for it on Hamas. The cease-fire reached its end just weeks before Israel elections, providing Livni and Barak with an opportunity to prove to their people that they’re prepared to get tough. Now, “Israelis are not known for mercy and grace” as pointed out by Israeli-born Jazz musician Gilad Atzmon.4 But the Israelis—and more importantly, the world—have a right to know that the Israeli government had a choice, and it still does. Hamas offers them a sustainable cease-fire in exchange for ending the siege, and they have answered with murdering hundreds of people. But as Defence Minister Ehud Barak declared, “There is a time for a cease-fire and a time to fight. Now is the time to fight.”5 And because the warfare was a deliberate choice by the Israeli government, not something it was forced into, Israel has once again proven it prefers ethnic cleansing and apartheid over co-existence. This article was posted on Saturday, January 3rd, 2009 at 8:59am and is filed under Anti-war, Incarceration, Israel/Palestine, Militarism, Zionism. i’v been kicked out of haaretz. i, too, found out that haaretz is a criminal paper. The most likely reason why European leaders have been reluctant to speak out too forcefully on Gaza is that they suspect that that is precisely the trap Israel is setting for them. What Israel really wants, I would guess, is European troops in Gaza but European leaders have no wish to be sucked into the hornet’s nest. As soon as European leaders call for a ceasefire, Israel will say “Fine, send in peacekeepers”. The Europeans have called Israel’s bluff, forcing it to launch the land invasion it is clearly scared of launching. In fact, it actually suits the EU very well to be presented as an Israeli stooge! It destroys the credibility as a peacekeeper or honest broker that it doesn’t want to have in the first place!